You might have noticed on television recently the latest advertising campaign by the renowned boiler manufacturer Worcester Bosch. It revolves around a particularly sociable cat named “Worcester”. On a cold winters day our hero takes advantage of his owner’s decision to go out shopping by offering a warm paw of friendship to those less fortunate than himself. 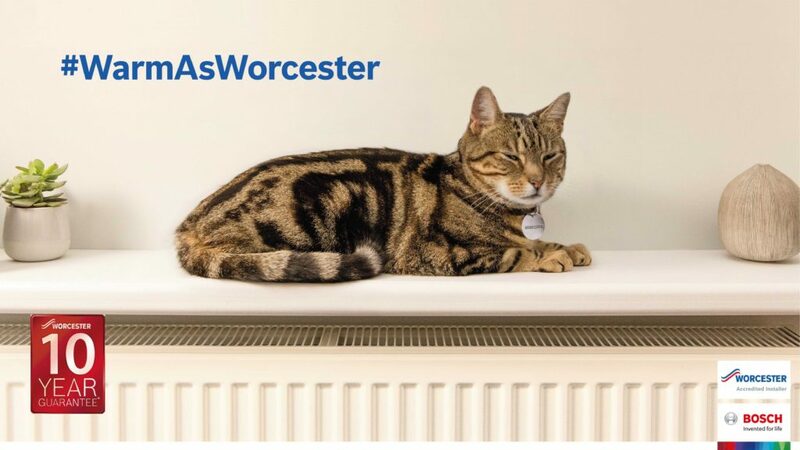 He subsequently invites his feline buddies to leave the cold outside and be “as warm as Worcester” in his Worcester Bosch centrally heated home. 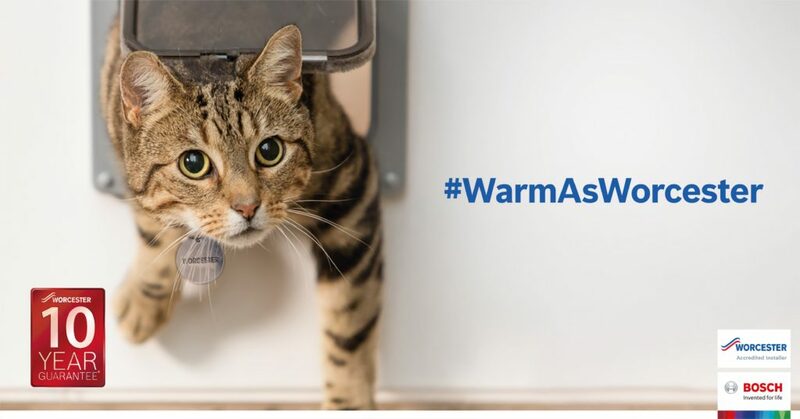 Regardless of whether you have seen the ad’, you have probably heard of Worcester Bosch and there is a very good chance your home is heated by one of their Boilers. Worcester Bosch is the UK’s most popular domestic boiler manufacturer and is viewed across the heating industry as being – for most situations – the most suitable boiler for the home. Worcester Bosch are UK based, but no prizes for guessing where they are located! They joined forces with The Bosch Group in 1992 where their innovative Worcester combi-boilers (which increasingly used gas instead of oil), contributed to the successful merging of the two companies. At Limegreen in Cardiff we have installed thousands of boilers for commercial and domestic clients across South Wales, many of which are Worcester Bosch. We have worked closely with Worcester Bosch for many years and will continue to do so, simply because they build very reliable and increasingly efficient boilers – perfect for our customers. The after sales service provided by Worcester Bosch is where – in my view – they deliver the biggest punch. Should your boiler not work correctly, it is likely to cause a disruption to your routine and you would hope that the problem could be rectified as quickly as possible. Thankfully when it comes to attending to a faulty Worcester Bosch boiler, there are many accredited technicians throughout the UK who would be available to visit with you quickly. Limegreen is a Worcester Bosch Accredited installer and as an accredited installer we can offer our customers a ten-year – no quibble – guarantee on selected Worcester Bosch boilers. Non-accredited installers are not able to offer this. Due to the flammable nature of gas, it is imperative that our customers have the upmost confidence in our expertise. We want to provide assurances of our competence to install a boiler safely and are committed to upholding the highest of standards. At Limegreen, our customers have identified the importance of attaining recognition of our skill with the UK’s leading boiler manufacturer and Worcester Bosch want their customers to have peace of mind that the installer abides by industry standards. In fact, to become an accredited installer, we are required to submit to regular checks of all installers, which include providing proof of being Gas Safe and adhering to all other relevant certificates. All installers of Worcester Bosch boilers and heating systems who work for Limegreen are fully qualified gas engineers. Take advantage of our clever online quote tool! To help our customers decide which boiler is most suitable for their home, we have created an online boiler quote tool. By providing details about your home the online boiler quote tool will produce results detailing the best boilers for you. It considers amongst other things, the size of your home, the number of bathrooms and your current heating systems. Limegreen are based in Cardiff – close to the Cardiff City Stadium – where our large showroom is located to help our customers choose the perfect heating products for their home.